Home > Blog > Oxalis: “False” Shamrocks for a Happy St. Patrick’s Day! Oxalis: “False” Shamrocks for a Happy St. Patrick’s Day! Happy St. Patrick’s Day! Today is full of traditions for the Irish (and the Irish-for-a-day), and nothing is more symbolic of the day than the shamrock, Ireland’s traditional good-luck plant. True shamrocks (Trifolium spp.) are native to Ireland and Europe, though they’ve been introduced around the world, and are members of the pea family (Fabaceae). False Shamrocks, though, are found around the world – there are over 900 species. All part of the genus Oxalis, they’re often sold as “Shamrocks” since they resemble true shamrocks so closely, even though the two are only distantly related. Some varieties are known as wood sorrel, and these are often the types that “invade” lawns. (Learn more about the more than 900 species of Oxalis here). 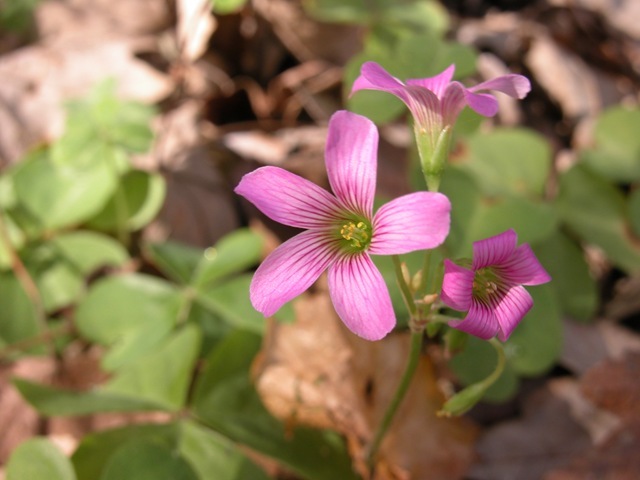 Oxalis violacea, known as Violet Woodsorrel, is native to the U.S. and can be grown outdoors in zones 5 – 10. In hotter climates, it will go dormant in the heat of summer, but will return when temperatures cool down again in the fall. The flowers vary from violet to pink, and the big-leaved foliage is fresh and pretty. Perhaps because it’s native to the U.S. and not considered all that “exotic”, it’s a little harder to find, but try the Odyssey Bulbs Catalog or Prairie Moon Nursery. Some varieties of Oxalis are considered invasive in some areas. Check your local gardening information before planting. Woodsorrels are edible and consumed around the world. They are safe to consume in small amounts, but when eaten in large amounts, the oxalic acid they contain can cause kidney issues. If in doubt, consult your doctor before consuming. Do you grow Oxalis? Tell us which varieties you prefer and where you grow them in the comments below! You say that the shamrock is not a four-leafed clover but I have found many small patches of four-leafed clover in among the three leafed white clover. It is not difficult to find them if you have a bit of patience. It helps to have a group of young people on the quest also. I just assumed that the four-leafed patch is a mutant plant of the three-leafed white clover. Maybe there is another four-leafed variety or species? I asked a friend of mine today if they were some type of weed. I never see them in lawn and garden stores. I have a large cluster of them in behind my garage. I was thinking about digging them up, I am glad I didnt.